I wish I were more enrapt by DC comics. I grew up a Marvel kid and never really understood DC beyond Batman and Superman, even though I had a fascination with Booster Gold during the New 52 reboot. And I probably couldn’t really tell you why I didn’t get into these characters, except maybe that buying comics can be a confusing process. Which one should I buy? Where do I start? When it comes to fighting games though, I think I know my stuff. I generally liked Netherrealm’s 2010 release, Mortal Kombat, and felt it did a good job of presenting a competitive fighting game within the boundaries of the Mortal Kombat feel and expectation. Now they’ve released Injustice: Gods Among Us, a game starring DC superheroes and villains. It’s certainly a chance to get closer to this universe I’ve wanted to know more about, but does the game stack up to their last effort? 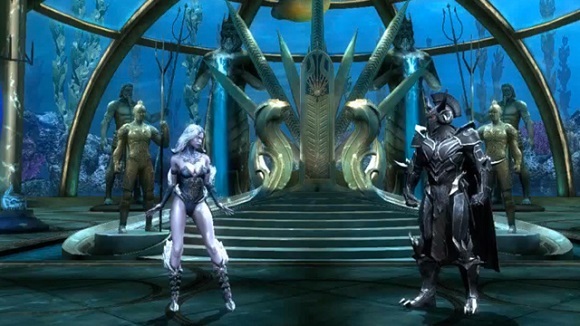 Injustice: Gods Among Us is titled because of the game’s setting. Shortly after the story begins, heroes and villains alike are sucked into another world. Whether it’s the future or an alternate universe is unclear, but when Batman is treated like the most wanted criminal on Earth, things are clearly bad. The story mode is mostly paint-by-numbers, but like its spiritual predecessor, Mortal Kombat, you won’t pick a specific character and fight a series of battles to see that character’s ending. Injustice’s Story mode unfolds over twelve chapters, wherein you will play a different character in each. For the most part, each character gets four fights, meaning you’ll have about 50 matches to go through. You’ll also have interludes that amount to quick-time events; Superman might have to shoot down cars with his eye laser, or Wonder Woman may have to block bullets with her wristbands. Fail at these challenges and you’ll enter the next match at a health disadvantage. I enjoyed every part of the Story mode because not only is the fighting fun, but at certain points, opponents in a match will say some fairly witty things to each other. As Story modes in fighting games go, Injustice: Gods Among Us has the greatest one ever made, but most of its foundation was trail-blazed by Netherrealm’s previous outing. The quality of the CG scenes that are played in between fights are of high quality, and they transition almost seamlessly into the battles you will encounter. I really enjoyed the interactions between the characters during these cutcenes. It was more fun to hear the banter between characters than I ever expected, and made me want to keep playing until I reached the end. It’s not a long journey however, and you’ll be finished in a little over four hours. On top of Story and Battle modes, which is your standard Arcade ladder and then some, there’s also a mode called S.T.A.R. Labs. In this mode, you’ll play 10 missions with each character. It’s a great way to get introduced to the characters’ mechanics and special moves without too much pressure, and the missions are reminiscent of Mortal Kombat’s Challenge Tower but with even more wacky missions. One mission has you dodge Harley Quinn and the Joker’s traps by timing your jumps, and another has you defending a citizen from hazards being thrown his way by executing attacks at the perfect moment. There’s sub-goals within each mission, and only the most dedicated will earn a perfect 3 stars in each. Mortal Kombat was and still is a competent fighting game, with an upcoming 3rd consecutive appearance at the Evo Championships. Among the competitive scene, there was some apprehension that the game would not try to be a competitive, high level fighting game. With Injustice: Gods Among Us, Netherrealm has a chance to create a new fighting engine without being bound to conventions of the past. First and foremost, there is no dedicated block button. Blocking is done, like other fighting games, by holding back. In what I can only describe as a brilliant idea, there is an option to have special moves be performed in either “regular” Mortal Kombat or “alternate” Street Fighter style. For example, you’ll either tap down, then back and press a button if you’re using regular controls, or perform a full quarter-circle motion, and then press a button if you are using alternate controls. Normal controls are faster and more accurate but I think that some, including myself, will gravitate to the alternate controls as they feel more familiar and comfortable – especially for veteran joystick jockeys. Each of the 24 characters in the roster of Injustice: Gods Among Us play very uniquely and feel different. Deathstroke fights best from a distance and has more ranged attack options than anyone. Solomon Grundy just wants to get in and grab you all day. Lex Luthor fights in a suit of powered armor that makes him somewhat slow, but allows him to have an attack range that’s nuts. I don’t feel like there’s any similarity between ANY two characters on the roster, and I have fun with the vast majority of the cast. This is further reinforced with the character trait system. When pressed, this trait button allows players to activate a unique, character-specific ability. A few notable examples include Superman gaining additional damage, Deathstroke’s bullets becoming unblockable, and Cyborg obtaining the ability to heal himself. These traits last a short span of time after activation and, for some, even have temporary side-effects. Thanks to these unique traits Injustice: Gods Among Us makes it very clear that there are no multi-colored palette swapped ninjas to be found here. The fighting system borrows a few elements from other games in the genre, past and present. Like Darkstalkers 3, there is no pause between rounds and the health you had remaining at the end of a round is the health you have at the beginning of the next. It borrows a little bit from Street Fighter 4, with a super meter segmented into four parts. It costs one part to enhance a special move, and two parts to cancel the animation of certain moves, giving you the chance to create bigger combos. 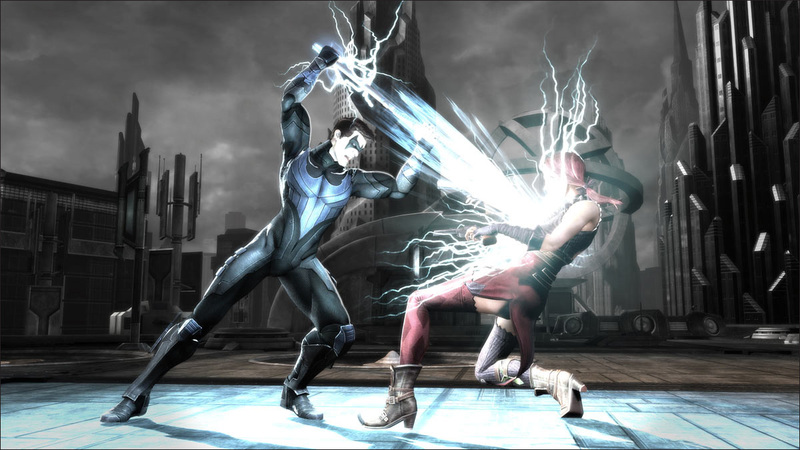 It also takes some pieces from Mortal Kombat: The combo system in Injustice feels very similar to that game, and you can break a combo – though you can only do this once per match. Combo breaking is done through the new Clash system, where players can bet portions of their super meter against each other. The winner will either recover health, or do damage to the enemy. This sounds like an interesting idea, but in practice, people generally bet their maximum amounts or nothing. The moment the Clash begins, you already know who is winning. There is one other innovation here, and that’s interactivity with the environment. While some games have the ability to knock people into walls, and some games might have areas of the stage that have traps, none do it as deeply as Injustice: Gods Among Us. Different stages have different interactive sections. For instance, in the Atlantis stage, there are valves located on each corner of the level. Turning the valve or breaking the glass nearby will shoot an unblockable stream of water at the opponent. In fact, in Injustice, all environmental or stage attacks like this are unblockable and do significant damage. This definitely feels like a mechanic to help people who might not be as talented at the game make a comeback, or feel like they are doing well in the game. Environmental attacks, if predicted, can be avoided or countered before the opponent reaches them. However, their very existence gives new meaning to the phrase “controlling space” in fighting games. All of sudden, maybe it’s not so bad to be in the corner. Some characters will play better on different stages, so it seems like the act of choosing a stage will become as important in tournament play as character selection itself. Both players can choose a stage, and if they choose different stages, one is picked at random from the two selected. I had high hopes for the online mode. Mortal Kombat was playable online, but the lag was noticeable enough that it would alter the timing of combos. Injustice: Gods Among Us brings back the popular King of the Hill mode, and adds a new twist with the Survivor mode, but the lag is so noticeable that I have to adjust the timing of my combos. In the year 2013, with games using the GGPO framework and feeling flawless, I shouldn’t have to feel this lag. It doesn’t feel improved in the least from Mortal Kombat. Maybe most people won’t notice, but I do, and many of the pros I talk to have noticed as well. Some of the more hardnosed have claimed to “give up on online mode.” This might be harsh, but if that attitude starts to spread, it could hurt the game’s momentum before it has any chance to build a large following. Another omission from Injustice is any form of Tag Battle mode. I feel that Tag Battle has much more potential to be fun in Injustice than in Mortal Kombat because of the character diversity and the chaos of the various levels and environments. Maybe this isn’t so much an omission as a feature that was never planned for inclusion to begin with, but if I start thinking about the implications of a tag feature in Injustice, it is sorely missed. There are parts of Injustice: Gods Among Us that I love that don’t really stand out as major features but deserve some mention all the same. The game’s main menu is beautiful. High quality CG renders of characters slowly spinning are the backdrop to a minimum number of options across the bottom of the screen. Sometimes, an arm of a character will spin into view, and I could swear it was popping out at me. Sometimes I just wait at the menu screen, gawking at the graphics. Watching it makes me happy to be here, playing this game. The fact that there are a minimum number of selectable options in the menu at any one time means it’s easy to find what you want. I would argue that Mortal Kombat felt more cluttered, with some options tucked away in unexpected locations. Quite frankly, this is my current favorite main menu in video games, and I wanted to point out just how excited it made me to play the game just by the quality of it. I also want to point out a great feature of the training mode: The ability to tag moves. You can go into your move list during training mode and tag moves or combos you want to work on. They will appear at the top of your HUD for easy reference. That’s it. And it’s just a simple feature, but one that I think is great for new players looking to master combos. There’s also plenty to find in the Archives, where additional content can be unlocked over time. You can get additional costumes for each character, and also unlock new variants of the single player ladder battle modes. There’s also concept art which I found to be substantial and interesting, unlike concept art from other fighting titles like Marvel vs Capcom Origins or Darkstalkers Resurrection. Injustice: Gods Among Us is a good game, make no mistake. It has an excellent, cinematic story mode, and a deep character roster, where each character is unique and fun to play. There is also polish in places where polish isn’t normally thought of, like the menu screen. But in this day and age, I feel that online multiplayer in fighting games has to be perfect. With fewer and fewer opportunities for in-person play, online is the last refuge anyone will have for competition. Real competition is the only way people can truly improve at a fighting game, and if the online has too much lag, it is no substitute. 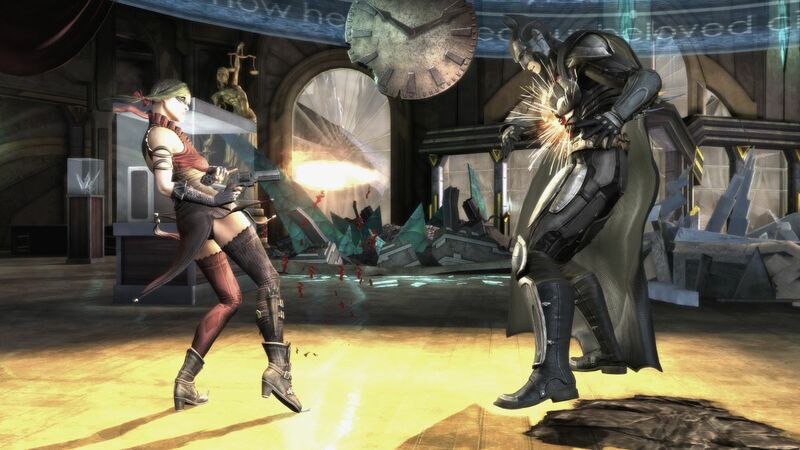 Injustice’s online play is adequate, but that’s the best I can say about it right now. Even so, with the crossover appeal this title has, I really hope it gains acceptance. It’s simply a fun fighting game to play. Ted played Injustice: Gods Among Us on Xbox 360 through the entirety of Story Mode on Hard, and started, but not finished S.T.A.R. Labs mode. He played over one hundred online matches before beginning this review, spread out across Ranked Match, Player Match, King of the Hill, and Survivor. He plays with a MadCatz TE Arcade Stick, and prefers alternate Street Fighter style controls at this time. A review copy was not provided by WB Games.